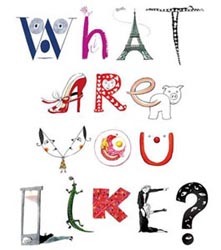 In 2008 The House of Illustration invited people from many disciplines to express themselves visually by playing "What Are You Like?" This was a Victorian parlour game in which players were asked to describe themselves by doing a series of drawings of their favourite things. Contributors included Andrew Marr, Anna Ford, Bill Feaver, Brian Eno, Bruce Ingman, Dan Fern, David Adjaye, David Gentleman, David Shrigley, Donald Urquhart, Emma Chichester Clark, Eric Clapton, Eric Carle, Jeff Fisher, Joanna Carey, Joe Berger, Georgina von Etzdorf, Glen Baxter, Jack Penate, Jan Pienkowski, Laura Carlin, Lauren Child, Margaret Howell, Marion Deuchars, Mary Fedden, Mary McCartney, Michael Foreman, Mini Grey, Mio Matsumoto, Nick Garland, Sir Paul Smith, Russell Mills Sara Fanelli, Shirley Hughes, Steven Appleby, Wendy Ramshaw and William Packer. Contributors were asked to illustrate eight favourite things from a list of twelve – their favourite animal, book, clothes, comfort, food, pastime, place, possession, music, shoes, weather and their pet aversion. They were encouraged to use whatever medium they most enjoy. The resulting artworks were variously extraordinary, revealing, humorous, mysterious. Sixteen were selected to be produced as signed prints, each strictly limited to an edition of 50. 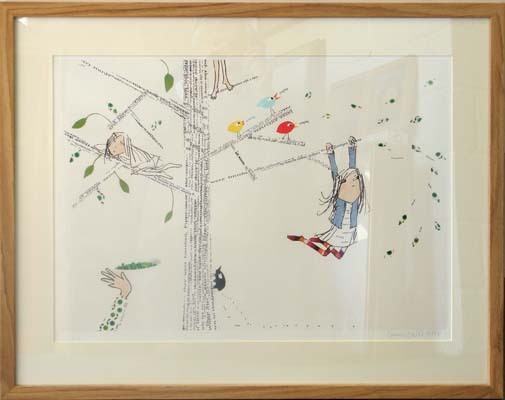 Over 60% of all proceeds go to the House of Illustration project - Quentin Blake's vision for the world’s first centre dedicated to the art of illustration in all its forms. The House of Illustration will be the first gallery in the UK dedicated to celebrating the art of illustration. It will showcase illustration both past and present from all over the world and be a hub for illustrators and enthusiasts of all ages. The gallery hopes to have a permanent home in the Kings Cross regeneration area by 2011. Recommended frame - a 20mm plain oak square section with off-white museum acid-free mount.